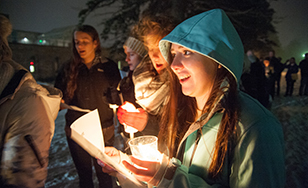 The College invites the public to its annual Advent Vespers service followed by a Christmas tree lighting ceremony, all starting at 4:30 p.m. Tuesday, Dec. 5 on campus. The Advent Vespers service, conducted partially in candlelight, offers a reflective start to the Christmas season and takes place in Our Lady Queen of Peace Chapel between St. Scholastica Monastery and Tower Hall. The service begins at 4:30 p.m., and will be immediately followed by the Christmas tree lighting event at about 5:15 p.m. in front of Tower Hall's main entrance. Participants will proceed from the chapel to the front steps of Tower Hall carrying candles, and a few brief remarks will precede a countdown to the tree lighting. Faculty and staff inside Tower Hall are asked to turn off their office lights before the event, creating a more dramatic effect when the campus Christmas lights are turned on. Afterwards, St. Scholastica's choirs will lead the crowd in Christmas carols and guests will be invited to enjoy cookies and hot chocolate inside the Tower Hall foyer. The event is sponsored by the Student Alumni Association. Both the Advent service and the tree lighting event are free and open to the public. For more information, contact St. Scholastica's Alumni Relations office at (218) 723-6071 or alumni@css.edu.